Rated R for gore and mild body horror. Fascinating setting and cool story. Cutting up gods is of course a trope in mythologies such as Norse or Greek, it also appears in Hinduism if I'm not mistaken. Including YHWH in the story was a bit jarring though because that's a totally different paradigm. The volume drops precipitously after the intro, and I couldn't make out what was being said. I think I'm going to have to edit this in audacity to raise the volume of the story section and I'll be able to listen to it. I second this, except that even at maximum volume, I couldn't hear the story at all. Had to skip this one. I really enjoy this podcast, but this is not the first story where the volume has dropped so much after the intro. In the past, I could struggle through, but nothing I did today allowed me to hear. It is very frustrating! 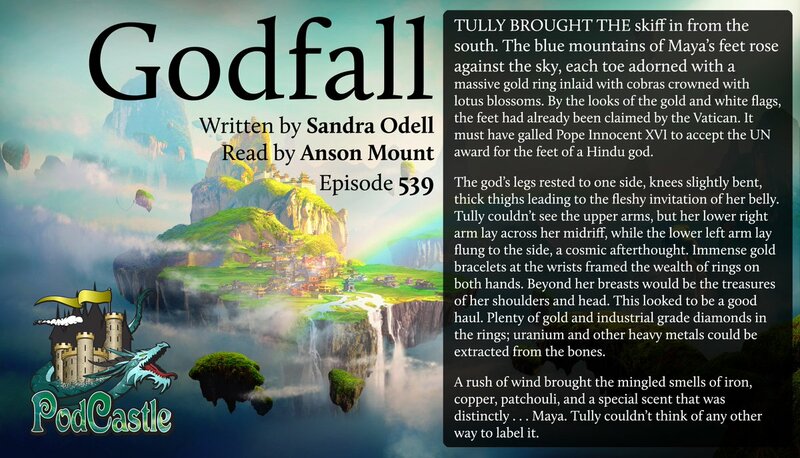 Godfall was intensely weird, and I delighted in the apocalypse cult at the edge of the screen. This story lives in the same neighborhood as Ligotti’s “The Last Feast of Harlequin” as well as Laird Barron’s Old Leech cycle. I didn't have the volume issue. Was listening to it on an ipod while in the gym. This was very sad and also creepy. Here's proof that gods are real, but they are all dead when you see them and consumed by unstoppable space worms. From my personal world view, I would expect societies and everything to really fall apart, leading to an even more apocalyptic world than the one in the story. The way Maya was described as very beautiful, and then ripped apart by the scavengers was tragic.